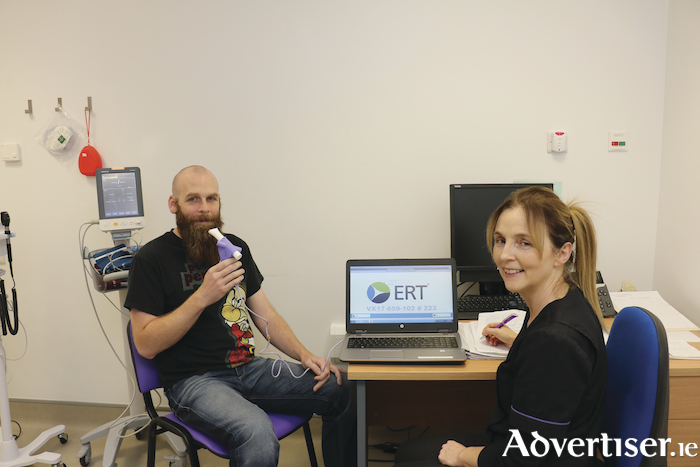 Patients at Galway University Hospitals have taken part in a landmark trial that demonstrates a significant advance in cystic fibrosis (CF ) care, Saolta announced yesterday. A new triple combination drug from Vertex pharmaceuticals, tezacaftor and ivacaftor — plus an experimental one, known as VX-659 - was tested on adult CF patients with the more common delta 508 gene mutation. Up to 90% of Irish CF patients have at least one copy of this mutation which causes CF. The results were published in the October edition of the New England Journal of Medicine. For the study, patients with cystic fibrosis were randomly assigned to either take the triple-drug regimen or be in a comparison group. After four weeks the triple-drug therapy improved lung function by on average up to 13 per cent and patients also reported a very significant improvement in their quality of life. Dr Michael O’Mahony, Adult CF Physician in Galway University Hospitals was the principal investigator in Galway for the study. “This study is a hugely significant breakthrough,” he said. “We are delighted with the results and along with our colleagues in Dublin, Cork and Limerick we were lucky to be one of the small number of centres worldwide that took part in this study. “Thanks must go to all the team in the HRB Clinical Research Facility Galway and the hospital for making our participation in these studies possible. We are currently involved in the Phase 3 study looking at the longer term effects of this drug. If the promising results we have seen persist, then most CF patients will see their lives improved considerably,” he concluded. Chris Kane, General Manager, Galway University Hospitals said that participating in drug trials is an essential part of the research required to discover new treatments and to find out which treatments work best for our patients. “We are very fortunate to have the HRB Clinical Research Facility Galway on the hospital campus which provides the ideal setting for our doctors to work with patients in a research setting with facilities to support bioscience research.